3/7/19: Cathedral Canyon Golf Club currently has 18 holes open. Flooding repairs from recent storms are still in effect. When you golf at Cathedral Canyon Golf Club by Welk Resorts, you can expect 18-holes of beautiful championship golf. With cool shades of tree lined fairways, 16 lakes, well maintained undulating greens, and strategically placed bunkers that challenge golfers of all skill levels, our desert golf course is one of the best in Palm Springs, CA. This prestigious course was designed in the early 1970s by renowned Southern California architect David Rainville and hall of fame golfer, Billy Casper. It’s desert golf course layout takes advantage of the naturally rolling terrain and the magnificent views of the San Jacinto Mountains. Voted “Top 25 most improved U.S. courses in 2016 on Golf Advisor“! Cathedral Canyon offers all the required amenities and more – grass driving ranges, short game areas, on location fully stocked golf shop, and restaurants and lounges that seat up to 150 guests. 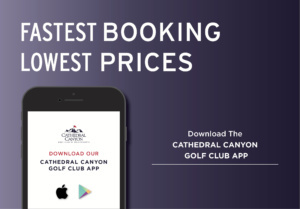 With substantial reinvestment and natural beauty, Cathedral Canyon is truly one of the best values in the valley making it the perfect desert golf course to host golf events and outings. Complementing Cathedral Canyon Golf Club is the newly renovated Clubhouse and the Canyon Grill. The Canyon Grill hosts a full bar and café that serves a delicious menu. The clubhouse is an ideal venue for golf course weddings, banquets, and other special events. For specials and events, contact the Pro Shop (760) 328-6571 for more information. The Cathedral Canyon Golf Club is the ideal venue for your next golf tournament or special event. With a renowned desert golf course layout and banquet facility of up to 250 guests, Cathedral Canyon is a perfect option for groups of 16 to 144 players! Join us for some fun and learn a sport you can play at any age. Call the Pro Shop (760) 328-6571 for more information. Available exclusively to homeowners in Cathedral Canyon Country Club. 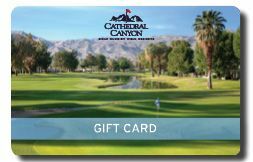 Take advantage of the discounts that are available over the full term of your Cathedral Canyon MY CLUB Card. 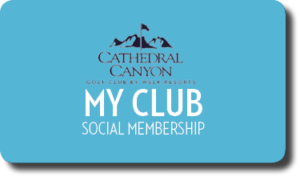 For events and to sign up for the Cathedral Canyon Country Club newsletters, visit www.ccccCommunity.com. For more information, contact the Golf Shop (760) 328-6571. *Rates Subject to Change. Prices include cart. For club rentals and pricing, contact the pro shop at (760) 328-6571. Enjoy Over $2,000 in Golf Deals and Discounts! 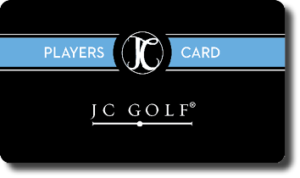 Offering cardholders free rounds of golf and discounted green fees at the area’s finest Golf Courses, the JC Players Card program is Southern California’s best golf value. Click card for more details. Gift cards are available in the pro shop or click below for online orders. Sign up to receive our golf information newsletter with news alerts and specials for all of JC Golf’s amazing golf courses.